Kenneth Baker to review current exhibit…BYE, BYE BIRDIE. 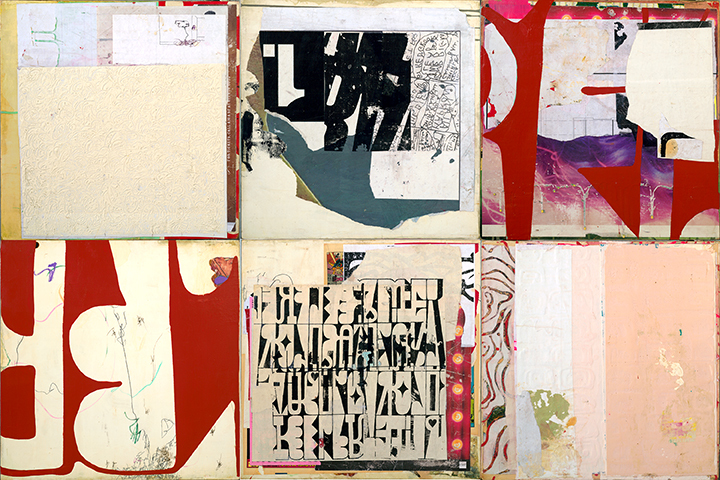 One More Time,” a mixed-media creation on panels, shows all of Michael Cutlip’s collage skills in play. Photo: Tony Molatore,, Berkeley Giclee, K. Imperial Fine Art, S.F. After photography, collage is the most democratic modern art technique. Stuff piles up in everyone’s life and memory, but few, even among collage makers, can reorder it as artfully as Berkeleyan Michael Cutlip. A show of his recent work fills to bursting the tiny K. Imperial Fine Art space. in remnants and flashes of novelty. assemble it in ways true to our experience of perpetually interrupted observation and recall. nimble jumps between levels of detail that yo-yo the viewer’s focal distance, blasts of ciphers that turn seeing into reading and back again. And note how well he handles his objects’ edges, often the least resolved zone of the collagist’s art. a balancing act that many who work in this vein never perfect. Cutlip proves his light touch in yet another way by allowing humor to leak into and from his work. The absurdities of daily life often spark in the sort of collisions the collage scavenger prizes. Cutlip neither forces nor resists them, offering, in this regard, an example to us all. Michael Cutlip: Bye, Bye, Birdie: Collage paintings. Through June 30. K. Imperial Fine Art, 49 Geary St., S.F. (415) 277-7230, www.kimperialfineart.com.